Has Emily found a new love interest? She looks smitten in this scene, doesn't she? Lucas does NOT look happy in this picture, does he? The kid isn't satisfied with what he sees. 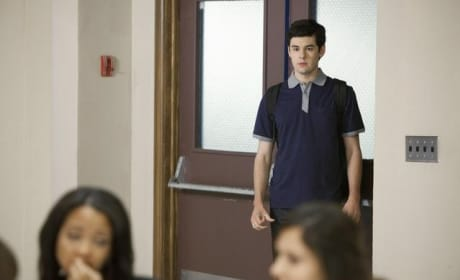 Caleb and Hanna hang out here in the school cafeteria. The scene is from the episode "Blind Dates." I actually stole my sister's wedding ring. Permalink: I actually stole my sister's wedding ring. Leave it to A to make you feel bad about your mom feeling good. Permalink: Leave it to A to make you feel bad about your mom feeling good. 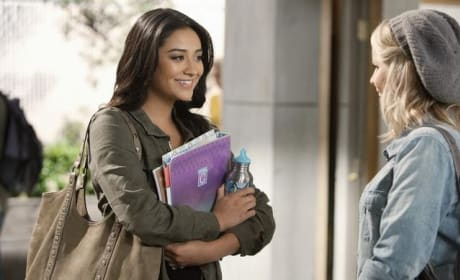 Pretty Little Liars Round Table: "Blind Dates"